One of the most beloved comedies in television history will light up the airwaves at 10pm on New Year's Eve, Sunday, December 31, when WLNY-TV (Channels 10/55) presents is annual The Odd Couple Marathon marathon from 10 p.m. to New Year's Day 9 p.m. It's 23 hours hours of non-stop laughs! The marathon will include 46 episodes from the classic series, including the 1973 "My Strife in Court" episode, featuring Felix attempting to act as his own attorney in court (7:30 p.m.) and the 1975 "Felix Remarries" episode when Felix convinces his ex-wife to remarry him (8:30 p.m.). 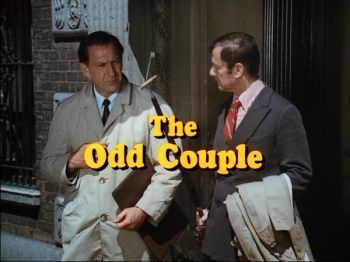 WLNY's The Odd Couple Marathon marathon will also feature the 1973 "The Ides of April" episode where Felix inadvertently gets Oscar called in for an audit from the IRS (6:30 p.m.), 1973's "Let's Make a Deal" episode, where Felix and Oscar appear on a game show in an attempt to win Felix a new bed (11:00 p.m.) and the 1973 "Take My Furniture Please" episode where both Felix and Oscar take turns redecorating their apartment (6:00 p.m.). Grace and Frankie returns January 19 on Netflix for a 4th season and trailer is now out. See below to view! In Grace and Frankie, Jane Fonda ("Grace") and Lily Tomlin ("Frankie") star as two women whose lives are turned upside down when their husbands reveal they are gay and leave them for each other. Both sparring partners and partners-in-crime, Grace and Frankie form an unlikely and unbreakable bond and face their uncertain futures head-on, hand-in-hand. Together with their ex-husbands and children, they discover the true definition of "family," with laughter, tears and plenty of mood enhancers along the way.